Editor’s note: This item originally appeared in the November 2015 issue of Inmotion. Once empty fields surrounding Bush Turnpike Station, located on the border of Richardson and Plano, are being filled with an expansive mix of residential and commercial development. Trammell Crow Residential literally is laying the groundwork for another big apartment community adjacent to the rail station and KDC’s $1.5 billion CityLine project in Richardson. 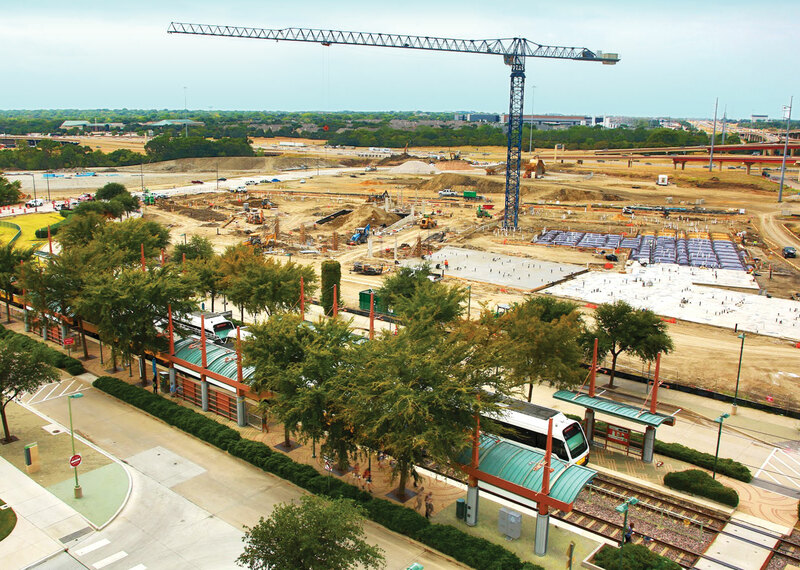 Michael Spicer, development services director for Richardson, said light rail has set the tone for new development around each of the four stations located in the city. These stations have created opportunities that bring jobs, attract investment and foster urban neighborhoods that provide an alternative to conventional suburban living. Just on the other side of President George Bush Turnpike, a 386-unit apartment complex is under construction in Plano. Trinsic Residential Group expects the project, also within walking distance of the station, to be complete by the fourth quarter of 2016. However, residents are expected to begin moving in early next year. Longtime Plano resident Shannah Hayley, director of marketing and community engagement with the city, is a huge proponent of public transportation.